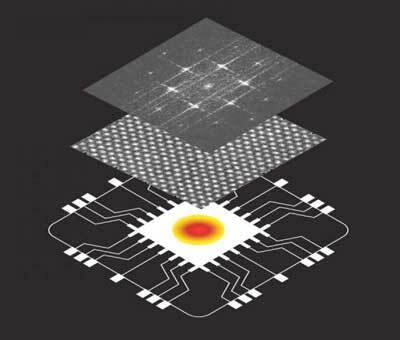 (Nanowerk News) Working to address "hotspots" in computer chips that degrade their performance, UCLA engineers have developed a new semiconductor material, defect-free boron arsenide, that is more effective at drawing and dissipating waste heat than any other known semiconductor or metal materials. This could potentially revolutionize thermal management designs for computer processors and other electronics, or for light-based devices like LEDs. The study was recently published in Science ("Experimental observation of high thermal conductivity in boron arsenide") and was led by Yongjie Hu, UCLA assistant professor of mechanical and aerospace engineering. Computer processors have continued to shrink down to nanometer sizes where today there can be billions of transistors are on a single chip. This phenomenon is described under Moore's Law, which predicts that the number of transistors on a chip will double about every two years. Each smaller generation of chips helps make computers faster, more powerful and able to do more work. But doing more work also means they're generating more heat. Managing heat in electronics has increasingly become one of the biggest challenges in optimizing performance. High heat is an issue for two reasons. First, as transistors shrink in size, more heat is generated within the same footprint. This high heat slows down processor speeds, in particular at "hotspots" on chips where heat concentrates and temperatures soar. Second, a lot of energy is used to keep those processors cool. If CPUs did not get as hot in the first place, then they could work faster and much less energy would be needed to keep them cool. The UCLA study was the culmination of several years of research by Hu and his students that included designing and making the materials, predictive modeling, and precision measurements of temperatures. The defect-free boron arsenide, which was made for the first time by the UCLA team, has a record-high thermal conductivity, more than three-times faster at conducting heat than currently used materials, such as silicon carbide and copper, so that heat that would otherwise concentrate in hotspots is quickly flushed away. "This material could help greatly improve performance and reduce energy demand in all kinds of electronics, from small devices to the most advanced computer data center equipment," Hu said. "It has excellent potential to be integrated into current manufacturing processes because of its semiconductor properties and the demonstrated capability to scale-up this technology. It could replace current state-of-the-art semiconductor materials for computers and revolutionize the electronics industry." The study's other authors are UCLA graduate students in Hu's research group: Joonsang Kang, Man Li, Huan Wu, and Huuduy Nguyen. In addition to the impact for electronic and photonics devices, the study also revealed new fundamental insights into the physics of how heat flows through a material. "This success exemplifies the power of combining experiments and theory in new materials discovery, and I believe this approach will continue to push the scientific frontiers in many areas, including energy, electronics, and photonics applications," Hu said.